“It changed my life to be there. It’s very rare as a filmmaker that you actually get to revisit your heritage and what means the most to you,” said writer, producer and director Michelle Latimer at a recent screening of her films Sacred Water and Red Power. The films received a standing ovation from the crowd, which brought Latimer and several audience members to tears. As part of their fall programming, Cinema Politica screened two films by Latimer on Oct. 2. Latimer, a graduate of Concordia’s film program, partnered with VICE Canada to make RISE, an eight-part series that showcases “Indigenous communities across the Americas […] protecting their homelands and rising up against colonization,” according to VICE’s website. Cinema Politica screened the first two parts of the series, titled Sacred Water and Red Power, which document the events surrounding the Dakota Access Pipeline (DAPL) protests that took place at the Standing Rock reservation in North and South Dakota last year. The screening was followed by a discussion with the filmmaker, who is in Montreal to be part of Cinema Politica’s jury at the Festival du Nouveau Cinema. Sacred Water introduces DAPL and what its installation means for the Indigenous communities that live in its path. Essentially, if built in its entirety, DAPL would destroy about 380 sacred sites that are home to a variety of Indigenous tribes in the central United States. Additionally, the pipeline would threaten the water supply of all Indigenous tribes living along the Missouri River and in the surrounding area. Red Power expands on the political dynamics that surround the pipeline and uses historical footage to show how the Indigenous population in the area have been treated throughout history. Latimer, who is Algonquin Metis, spent nine months at the reserve getting to know the growing community there and documenting their struggle to hold onto their land. At the screening, Latimer admitted that, although she knew the Standing Rock protests would be important to record, she did not anticipate the duration and size to which they would grow. The filmmaker chose to partner with VICE Canada for her films to reach a larger audience than she would have had on her own. While the concept of land ownership is a point of contention between Indigenous and non-Indigenous populations, the basic premise of the first two films is that the land the pipeline is set to cut through is extremely important to a large population of Indigenous people. They do not claim to “own” the land, but instead emphasize that generations of their people have lived off of it and it is not the U.S. government’s to take. In addition to running through sacred land, the construction of DAPL began without a building permit that needed approval from the Sioux tribe, who live on the Standing Rock reserve. The Sioux people, who call themselves water protectors, denied DAPL access to their land. In August 2016, however, the pipeline began construction despite not being approved. How dire this situation became is something Latimer emphasized after the films ended. “In my nine months there, I realized I’m willing to die for this. It gives a kind of power and personal journey to those films. I think you see the importance of what people are fighting for and why,” the filmmaker said. Unfortunately, less than a month after the water protectors’ short-lived victory on Dec. 4 2016, President Trump’s administration made the decision to follow through with the construction of the pipeline and everything the Sioux fought against. Latimer mentioned that DAPL is fully functioning today, already with a spill within the first three months of its construction. Although it may seem like the battle is completely lost, Latimer encouraged viewers to find the positives in the situation. She emphasized that what happened at Standing Rock can give us power and hope for the future. The DAPL protests were just the beginning of a bigger battle that we must continue to fight. Latimer noted that there are other pipeline projects that need to be stopped—such as the Kinder Morgan and Line 3—and action is already being taken to do so. The impact of the Standing Rock protests has already taken effect. 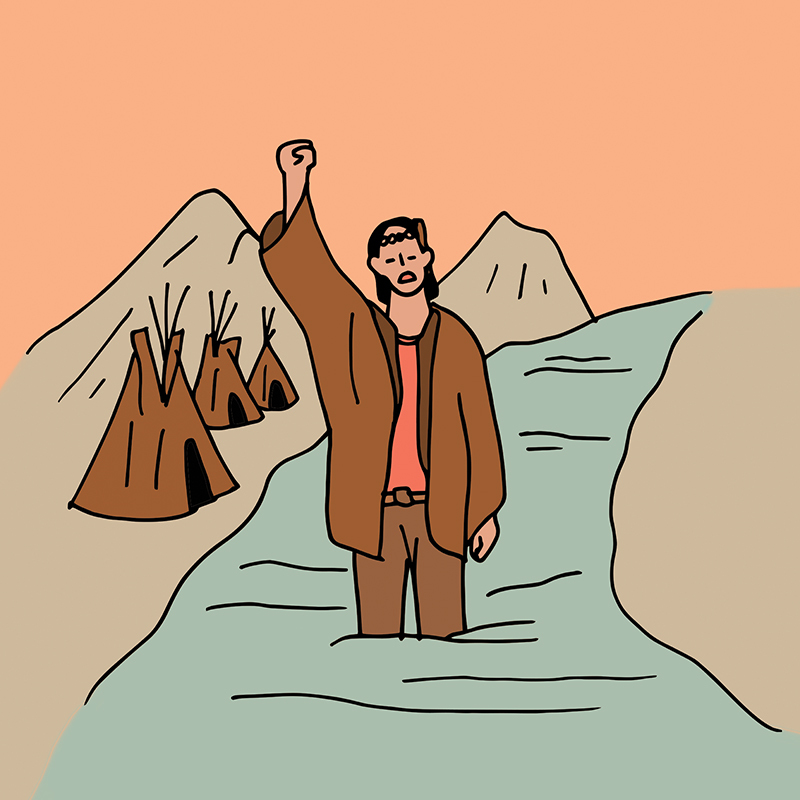 “[What’s] happening since Standing Rock is people are mobilizing, and they’re connecting, and they’re already looking at how to mobilize against these larger infrastructure projects,” Latimer explained. She explained that there were drum circles and concerts which took place almost every night at the Standing Rock reservation, as well as poster and banner-making tents which helped ignite participants’ spirits and gave them hope. Latimer found that her filmmaking allowed her to express her point of view as an Indigenous person and “channel” the stories of those around her. Latimer and the other Indigenous protesters in the film highlighted that the installation of these pipelines is not just an Indigenous issue—it concerns all of us. This is an environmental issue, a social issue, a global issue. “We have this planet to protect, and it’s all we’ve got,” she concluded. Sacred Water, Red Power and the rest of the RISE series can be found on VICE’s website. For upcoming Cinema Politica screenings at Concordia, visit www.cinemapolitica.org/concordia. Screenings are held in the Hall building in room H-110 every Monday at 7 p.m. Entry is by donation ($5 to $10 is suggested).